“I was in New York. I had my mom and dad with me, my sister was there and my agent. My college coach at the time and his wife were there. Everyone kind of had their speculations of ‘what number’ and what team. The teams we thought were going to take me didn’t, but it ended up working out perfectly for me.” — Ben, from the video, “Recalling Draft Day”. Ben arrives at Madison Square Garden that Saturday morning with plenty of supporters in his corner – his family, his agents Leigh Steinberg and Ryan Tollner, and his college coach, Terry Hoeppner and his wife Jane. At 11:20 a.m.: Ben and four others – Eli Manning, Roy Williams, Robert Gallery, and Kellen Winslow Jr. – are introduced to the crowd. • 12:25 p.m.: NFL commissioner Paul Tagliabue announces that the San Diego Chargers have selected Eli Manning with the No. 1 pick. Eli emerges from stage right and is greeted by unwelcoming chants by the Chargers fans in attendance. • 12:58 p.m.: NFL commissioner Paul Tagliabue announces that the New York Giants have selected NC State quarterback Philip Rivers with the No. 4 pick. Soon thereafter the trade with the Chargers is announced – Eli Manning is headed to New York, Philip Rivers to San Diego. Both fan bases seem pleased with the outcome….as Ben waits for his turn. • 1:57 p.m.: Pittsburgh is on the clock. “We see Ben Roethlisberger on the phone,” ESPN announces for the television audience. Sure enough, it’s Steelers coach Bill Cowher calling to tell Ben the Steelers are going to select him with the No. 11 pick. 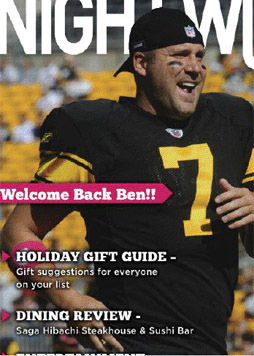 • 2:00 p.m.: NFL commissioner Paul Tagliabue announces that Ben is indeed headed for Pittsburgh. Ben arrives on stage and dons a Steelers ballcap and holds up a Steelers jersey. • 2:02 p.m.: Just off stage, Ben does a press conference for television reporters and then disappears from the public room to do a few interviews with the Pittsburgh media. • 2:43 p.m.: Ben emerges from the players’ party room where a press conference with print media is set up. An ESPN media representative announces, “Call from Steelers owner Mr. Rooney…” Ben takes the phone and his first words, “Yes sir, Mr. Rooney…”. 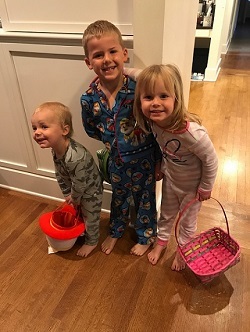 • 2:48 p.m.: After another media conference and a round of short one-on-one interviews that last until close to 3:30 p.m., Ben heads for the door – Steelers jersey still slung over his left shoulder. “We felt if Ben would drop to No. 11, we’re not up here every year in the draft, and a quality player like that is hard to pass up. He’s right there with Eli and Philip. The thing that separates him is experience. 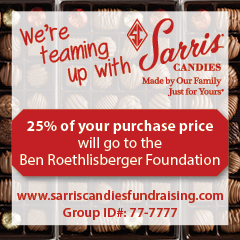 Ben only played one year in high school and three in college…It’s a good situation we have with the veterans in front of him, and not feel the pressure of having to turn the team around immediately.” — Former Steelers Coach Bill Cowher, on selecting Ben over a running back, April 24, 2004. If anybody had the right to feel exasperated watching the Eli Manning-Philip Rivers saga unfold Saturday, it was Ben Roethlisberger. Even after his name finally was called by the Pittsburgh Steelers with the 11th overall selection, Roethlisberger had to endure a news conference in which half of the questions were about Manning’s power play to stay out of San Diego. The other half were thinly veiled insults at the quality of play Roethlisberger faced in the Mid-American Conference, as if he should apologize for having attended Miami of Ohio instead of the other Miami — the one that had six players drafted among the top 21 picks of this draft. It’s hard to argue with Roethlisberger’s track record at Miami, where he led the school to a MAC championship and its first bowl victory in 28 years, a 49-28 win over Louisville in the 2003 GMAC Bowl. As a three-year starter, he passed for 10,829 yards and 84 touchdowns. You can read the rest of their NFL Draft report here. “Judging by body language, I think he is really happy, They have great receivers and most important, they have a great program. I think it worked out well.” — Ken Roethlisberger on his son’s Draft Day, from the interview below. 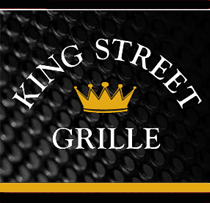 There are few NFL teams hated in Oxford, Ohio, more than the Pittsburgh Steelers. 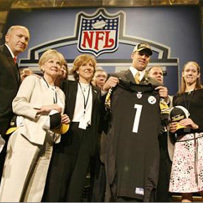 Much to the dismay of many Miamians, former RedHawk quarterback Ben Roethlisberger was selected by the Steelers as the 11th pick in the 2004 NFL draft Saturday. 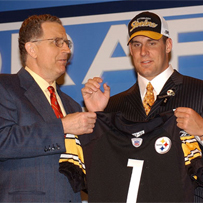 Roethlisberger became the highest drafted player in Miami history. 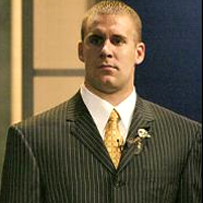 Roethlisberger was one of few draftees invited to Madison Square Garden for the draft and many experts predicted him to be selected within the top five picks. 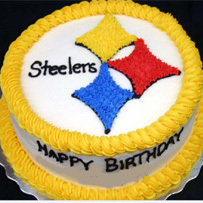 But as the draft unfolded, it became clear Roethlisberger would fall. “The Steelers also are eagerly pursuing Rivers in the final days before the draft, envisioning him as the eventual replacement for Tommy Maddox and a fallback candidate this year, in the event of an emergency. Rivers, who already has earned his degree in business and holds the NCAA record with 51 career starts, is considered a quick study and a better bet to succeed in his rookie season than Miami (Ohio)’s Ben Roethlisberger, who is leaving school with a year of collegiate eligibility remaining.” — Jerry DiPaola, Pittsburgh Tribune-Review, the night before the draft – April 23, 2004. Check back for a look at “Post-Draft Memories”! You can take a look back at Ben’s NFL Combine here, and his Pro Day workout here.